Posted: Monday, July 24, 2017. 8:44 am CST. By BBN Staff: The Government of Belize will have to spend more tax payers’ dollars repairing the bridge near Chetumal Street in Belama. Yesterday evening a man driving a blue van on the bridge lost control and crashed into the metal railing. 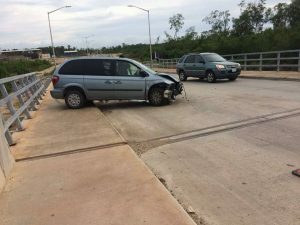 No one was hurt but the front portion of the van and the railing were both damaged.